Take Fort Kastav for the Imperials and rescue the prisoners within. Winterhold Imperial Camp, Fort Kastav. Planning the attack with Hadvar; Ft. Kastav in background to the east. Report to Legate Rikke at Winterhold Imperial Camp. Meet the Imperial scouts near Fort Kastav. Free the prisoners from their cells. Clear the fort of Stormcloak soldiers. Report back to the scout team commander. Report for duty to Legate Rikke at Winterhold Imperial Camp, east of Dawnstar. She will tell you to take Fort Kastav from the Stormcloaks. As the rebels currently hold some fellow Legionnaires in the fort's prison, you are to meet up with some scouts in the area, infiltrate the prison, release the prisoners, and then use their help to take the fort from the inside. When you agree to take the mission, the quest will initiate. Rikke will mark the scouts' location on your map (southeast of your location, about halfway to Windhelm), and you will note in your journal that your objective is to "Meet the men near Fort Kastav". You can successfully complete the quest without first sneaking inside and freeing the prisoners, but to accomplish all of the objectives as ordered, you must meet the scouts within a certain period of time, and you must avoid being detected by the rebels holding the fort before you get inside. The route you take to get there, and what you do on the way, can influence both of these contingencies. The meeting point is on a cliff to the southwest of the fort. If your route takes you next to the fort before you reach them, you are likely to be detected by a rebel sentry. While you can successfully complete the quest in this event, you will not be able to complete all the objectives according to the plan. Accordingly, if you will fast travel to a location near the fort, you may wish to select a location to the west or southwest of the fort, such as the Nightgate Inn, Forsaken Cave, or Fort Dunstad. This will allow you to approach the meeting point without passing the fort. 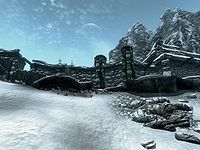 If you follow the Clairvoyance pathing from the camp, it will take you back into Dawnstar, then south out of town toward Fort Dunstad by the main road that lies west of town. Sometimes the pathing may not go through Dawnstar, but instead take you to the road just southwest of town. 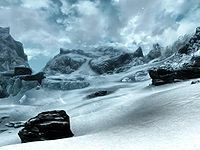 Expect a dragon attack in Dawnstar or just to its southwest. 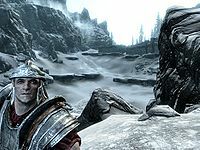 Travel quite a distance on the road south from Dawnstar. Eventually, you will likely encounter a frostbite spider attack. Shortly past the site of this, watch for a pair of stone piles on your left. They may be obscured by a tree and some grass (see photo). Turn left onto the paved road that they mark. If the road takes a curve to the right and you see Fort Dunstad ahead of you, you have missed it. This road will point you due east toward Fort Fellhammer, visible a short distance ahead of you. Fort Fellhammer will likely be guarded by bandits who will detect your presence and attack as you pass—unless you successfully sneak by, sticking to the right, and following the road as it curves to the right. If you engage them, then afterwards return to the road (southwest of the fort) and proceed south. There are no significant valuables around the fort's exterior. This road will take you southwards over a low hill and then down a fairly sharp descent. Where you level out, you are likely to be pounced upon by a snowy sabre cat or other hostile animal. Ice Wraiths also inhabit the general area. Before you reach Weynon Stones, identifiable by some stone pillars just ahead, turn left (east) at a T-intersection. Although the road you will run across is generally well-maintained, the paving stones are spotty here, so you may have to look around a bit to see it. As you proceed, your compass should show the tree icon marking Shrouded Grove ahead of you. Continue onward, and as this icon flies off to the right of your compass, you will reach a major crossroads marked by a prominent signpost and known to be a favored ambush point for thieves. After dealing with any such threat, turn left (east-northeast) toward Windhelm. You will pass the Nightgate Inn, on the right side of the road, and may wish to save your game in this area. At this point, you and the scouting team (of four men) are both nearing the meeting area. The scouts may meet one or more enemies, most likely including a frost troll. If such an attack occurs, it may happen before you arrive, while you are arriving, or just after you arrive. You may have an opportunity to intervene and reduce some or all potential fatalities among the scouts, thus giving you more allies when you eventually engage in the main battle for the fort. In any event, at least their leader will remain when you arrive, and he is all that is required. If you are unhappy with the number of scouts who end up alive, you can later reload a save from here. From the Nightgate Inn, continue east on the road. 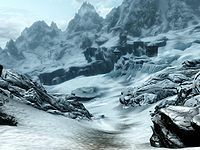 After a moderate distance, passing two roads departing up to the left, you will reach an intersection with a stone pile and a signpost marking the road to Winterhold running up to the left. This is another point at which thieves may lie in wait, or you may encounter a wanderer, such as M'aiq the Liar. From the signpost, turn toward your objective marker and head eastward up the hill off-road, and eventually right off a short cliff. Here you may encounter a frost troll, ice wraith, or other hostile, possibly ahead of you and to the right. If you do find enemies here, quick action—especially paralyzing or otherwise quickly incapacitating any frost troll—may help protect the lives of the scouting party. Note that getting lost in the mountains can carry two implications for how the quest unfolds. 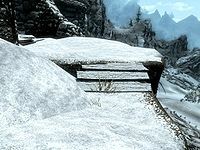 First, if your path ends up taking you past the fort on your way to meeting the scouts (and you are seen by a Stormcloak there), the optional objective of sneaking in to release the prisoners will not appear; however, the quest can still be completed in this event: The rebels will engage you directly and the scouts will come to your assistance. Second, the scouts will not wait for you if you become delayed for too long, either because it takes you too much time to find your way, or because you are too long delayed in battles (e.g., if you near Mount Anthor, you will likely confront more than one of the powerful dragons who nest in the area). In such an event, the objective of sneaking into the prison will not appear, and you will go directly into battling for the fort whenever you finally arrive. Head SE from Frostflow Lighthouse. You needn't get lost, however. The following route can get you to your destination quickly: From the camp, turn toward the objective marker on your compass and trek cross-country on the footpath you will find in the area. You will soon encounter a rocky mountain range extending to the right (southward). If you bear to the left of this, you will pass between Frostflow Lighthouse on your left and the rocky rise on the right. Turn south after passing the rock on the right. Once you pass over a small crest, you will see ahead of you some jagged rocks behind which lies an impassable chasm and some buildings which are part of the sprawling Dwemer ruin, Alftand. Navigate around this by passing the rocky area on your right, then turning right (south) instead of heading across the open area between you and the jagged rocks. Proceed southward for several hundred yards, ascending several rounded hills that rise in a somewhat step-like fashion, and passing Alftand Ruined Tower to your left. Head south until you pass Alftand Ruined Tower (middle-left). You may encounter an Ice Wraith or hostile animal in this area. You will almost certainly see a dragon who nests on the mountain peak, though the dragon may or may not see you. Your objective marker should now be pointing at a tall mountain peak to the southeast. If you approach its base and then skirt around to the right (southwest) of it, you should find yourself on a mountain path that travels through Wayward Pass. As you descend after Wayward Pass, be on the lookout for a path that turns to the left and heads uphill toward your objective marker. This is clearly a footpath, and not simply a clear area upon which you can climb up the mountain. This path will wind down and around, and then ends at a paved road which you can follow due east toward your marker. You may wish to save your game in this area. At this point, you and the scouting team (of four men) are both nearing the meeting area. The scouts may meet one or more enemies, most likely including a Frost Troll. If such an attack occurs, it may happen before you arrive, while you are arriving, or just after you arrive. You may have an opportunity to intervene and reduce some or all potential fatalities among the scouts, thus giving you more allies when you eventually engage in the main battle for the fort. In any event, at least their leader will remain when you arrive, and he is all that is required. If you are unhappy with the number of scouts who end up alive, you can reload from this point. 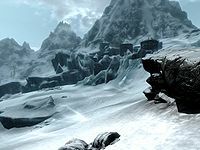 Remain on the paved road, heading eastward, until you approach an intersection with a stone pile and a signpost marking the road to Winterhold running up to the left. This is another point at which thieves may lie in wait, or you may encounter a wanderer, such as M'aiq the Liar. From the signpost, turn toward your objective marker and head eastward up the hill off-road, and eventually right off a short cliff. Here you may encounter a frost troll, ice wraith, or other hostile, possibly ahead of you and to the right. If you do find enemies here, quick action—especially paralyzing or otherwise quickly incapacitating any frost troll—may help protect the lives of the scouting party. Once you approach the scouts at the meeting point, you'll find Hadvar again, commanding them. The number of men under his charge can vary from three to zero, depending on how many may have been taken by the hostile creatures which infest the area. Speak to Hadvar. His plan is for you to sneak into the prison section of the fort through a grate located outside the walls. You should then find and release the prisoners, after killing the rebels guarding them. Once you release the prisoners, you are to make your way with them to the courtyard and engage the main rebel forces, at which point Hadvar and his men will also join to assist. If you tell Hadvar that you are not much for sneaking, he will say that he has faith in you, but also that if you get discovered at any point, you should run out into the courtyard and start fighting, at which point he and his scouts will come running. Hadvar will suggest waiting until nightfall before trying to sneak in. In reality, it's very easy to do this at any time. Your objective becomes to sneak in to the fort through the grate. However, you can successfully complete the quest no matter how you accomplish the fundamental objectives, which are releasing the prisoners and taking over the fort by killing all the Stormcloaks (in either order). Stealthily enter the grate, to which your objective marker is pointing. If you are detected before entering the grate, the current objective will fail, but those of freeing the prisoners and taking the fort will become active, and you can still successfully complete the quest. Despite Rikke's and Hadvar's emphasis on sneaking into the fort. It is actually not necessary to sneak at all because there are no sentries who can see in your direction unless you stray quite far out of your way to the north while en route to the grate. Head directly east toward the grate from Hadvar's location, jumping down the cliff and proceeding toward the quest marker. While you cannot be seen, it is possible for you to be heard as you approach the fort by a guard who is stationed just inside the wall. However, you must actually make an effort to generate enough noise to be detected. Head toward the left parapet. Wait until evening, get into sneak mode, and remove your armor or lighten the amount you're wearing. It is safest to have any follower wait for you, but if you want to bring one, you may wish to take from them any especially heavy armor and weapons. If you do bring your follower along, at least take away any torches that they may be carrying. Followers apparently missed a lesson in stealth school, and will readily light up any torch they are carrying while sneaking at night. Stand on the first set of steps. If you want to be extra-cautious, you can take further steps to try to remain undetected. From the bottom of the cliff, walk to the spottily paved road. Follow that toward the fort until the pavement appears to end (it actually turns to the north [left]). From this point, walk due east—between two flattish-top rocks toward a parapet in the wall—until you reach a few wooden steps. From those, turn to follow your objective marker to the grate. Proceed to the grate (top-left). If you open it without being seen, the current objective will clear, and your next objective becomes to free the prisoners. Open the grate. Once inside, follow Hadvar's plan by killing the guards before releasing the prisoners: The prisoners are unarmed in their cells, and therefore won't be much help if released into a battle. Once the guards are dead, upon release from their cells, the liberated prisoners will equip themselves with armor and weapons from a chest on the level above. Having slipped in through the grate, pass through the wooden door and then proceed through the small room toward the doorway at its far side. This opens into a larger room, on the east side of which is a wooden door which may be open or closed. If you wait, one of the three Stormcloaks guarding the prisoners will walk into the room at one end of his patrol beat. If your fight with him is noisy, it may draw in a second guard from further in and below by the prison cells. Pass through the door to the east and, around the next corner. From most of the way down the stairs ahead, may see the second guard who walks a patrol beat nearer to the prison cells. If that guard is not in sight, you can probably put an arrow in the back of the third guard, who spends most of his time sitting at a table at the very far end of the next room. He probably cannot be seen from the foot of the stairs unless you have eagle eye vision. You should be able to detect a lantern burning in the distance, however, and the guard will generally be sitting just to the right of this, laterally centered through the midpoint of the door between you. This would leave you with just one more to take care of. The chest next to the guard who was sitting at the table contains the prisoners' weapons and armor. In more recent versions of the game, these items are not visible (the chest appears empty), but the prisoners will nonetheless find their items there after they are freed. After the three guards are dead, you can either practice some lockpicking to open the cells, or take the Fort Kastav Prison Key off any of the guards or the table on the level just above the cells. Once all of the prisoners are all released, your remaining objective is to take the fort by killing the rebels in the exterior courtyard. Make sure that all four prisoners are released: The related objective should clear and you will note in your journal that retaking the fort is your next task. The prisoners will equip themselves with armor and weapons and await your lead into battle. If you speak with them, however, you will have the option of ordering them to wait where they are. Lead them up and out into the courtyard and begin the attack. Hadvar and his men will join in the attack when the fighting starts. Unlike the battles at previous forts, no additional enemies will materialize during the battle, and the killed will remain where they fall for some time, giving you a chance to loot their bodies at your leisure. When all the rebels are dead, report back to Hadvar. Hadvar will inform you that he will remain to garrison the fort while you go to report the success. He will also lament that none of the prisoners you freed survived the battle if none of them survived. The quest will complete. 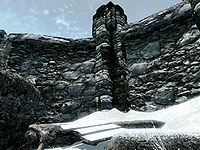 If you have the underlying Reunification of Skyrim quest active, you will be directed to report back to General Tullius at Castle Dour in Solitude. On speaking to him, the general will elevate you to the elite rank of Legate, and bestow upon you a piece of armor with the promotion. The quality of the armor may be underwhelming, especially if you are at a higher level although you can receive Dragonplate armor. You will not receive this quest if Winterhold is given to the Imperials during Season Unending. When General Tullius sends you to Legate Rikke at the Winterhold Imperial Camp to begin Rescue from Fort Kastav, (the "Regain Winterhold Hold" quest), she may not offer the "Reporting for duty" dialogue needed to proceed. The most reliable way to bypass this bug is to go to any indoor location and wait/rest for 30+ days. This allows all location cells to refresh, and the next time you travel to the Winterhold Imperial Camp, Legate Rikke will offer the "Reporting for Duty" dialog option. Repeatedly asking General Tullius, "How is the war going?" seems to fix the issue, and Rikke will eventually present the option. You may have to ask him each time you complete the missions, or alternatively you could try attacking her until she retaliates, then sheath your weapon and open dialogue again; this will sometimes work. You can use the console command setstage CWMission04 10 to start the mission. 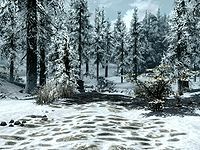 If nothing else works, you may need complete the entire Reunification of Skyrim quest via the console command setstage cwobj 255. You cannot use the console (setstage) to start the next appropriate quest. If you manage to retake Fort Kastav without losing any of the prisoners, the quest may not continue when you report back to Hadvar. ? Kill all the unnamed imperial soldiers that were prisoners. You should then be able to continue the quest by talking to Hadvar. Legate Rikke has sent me to Fort Kastav. I am to meet up with some scouts who will help me break into the fort's prison. I will then break out some fellow Legionnaires held capitive [sic] there and take over the fort. 200 Finishes quest We have rescued the prisoners and taken over Fort Kastav. The following empty quest stages were omitted from the table: 0, 11, 100, 255. On the PC, it is possible to use the console to advance through the quest by entering setstage CWMission04 stage, where stage is the number of the stage you wish to complete. It is not possible to un-complete (i.e. go back) quest stages, but it is possible to clear all stages of the quest using resetquest CWMission04. This page was last modified on 17 March 2019, at 22:44.